Jewish people in Argentina and their customs on the pictures below. 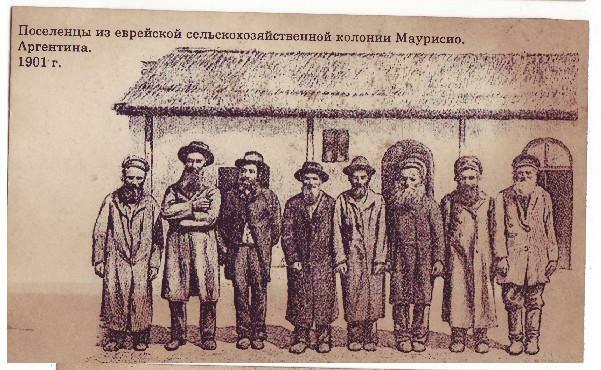 This is a picture of the first agricultural Jewish community in Mauricio, Buenos Aires Province 1901. Jewish agricultural settlement in Argentina began in 1888 under the auspices of the Alliance Israélite Universelle. Of the 136 families who arrived on the ss Weser in 1889, about 40 acquired land from a landowner, Pedro Palacios, and set up the Moisesville colony. The settlers suffered from hunger and disease during the first months of their settlement, due to lack of equipment and financial means. Wilhelm Loewenthal, a Jewish physician and naturalist, was invited by the Argentine government to carry out a mission of inquiry in the latter half of 1889.